In 2017, it is a big year for Apple, they announced revolutionary products and models in 2017. The Highlights of WWDC 2017 is that the new iMac Pro and HomePod devices. People are excited to see those products in action. The iMac Pro is a giant revolution with up to 18 Core processors makes it above of all computers. The small and efficient product is that the HomePod. Now Apple is taking a momentous decision in home management. They already have the HomeKit application to control home devices using your iPhone. Now they are making it to the next level of home management using the new HomePod. We can easily manage home devices using our voice just like Amazon Echo and Google Home. But what makes HomePod different from Google and Amazon? Let’s find out. Google Home is using Google Assistant as their voice assistant. We all know that it is the highly advanced voice assistant in the world right now. In HomePod Apple uses Siri as their voice assistant but some people hated Siri because of the lack of information and features, but in the latest version of Siri, everything is grown better now Siri can handle all the words that you throw at it. As I said, Siri has become well so managing all kinds of stuff using Siri is easier than before. In Amazon Echo, they have been using Amazon Alexa as their voice assistant. It is nice to have Alexa on a home device like an Echo because it is an open source voice API so third-party developers can take advantages of Alexa into their devices. We know that every product Apple releases has some unique features. We already did a comparison review of these three devices check it out here. What is new in HomePod? And will it be the best home device? Let’s find out. Let’s look at some specification so that you will get an idea about the components and technologies that used in HomePod. In this section we expanding the each specification with much more details. From the specification, you already get some idea about the features so if you don’t like reading you can skip this section. In HomePod Apple uses the custom designed mobo processor. What!!! A mobo processor in a speaker? Are they nuts? This is what you were probably thinking right now, but actually, it is true because Apple A8 Chip is used in iPhone 5S since 2013. Now they have A 10 and A10X chips. A8 chip is older but still powerful. Apple uses the A8 chip in the HomePod to make Siri faster so that it can handle all kinds of extensive information and can access other things faster. Putting an older Chip in a newer device, that is a clever business trick. An iPhone 5S user in 2017 can proudly say that his device is not outdated because the chip is still using in the latest products of Apple. In the future version of HomePod, I think Apple will use the A9 Chip, what do you think?. Talking about the sound technology, here Apple rocks the entire world with their HomePod. 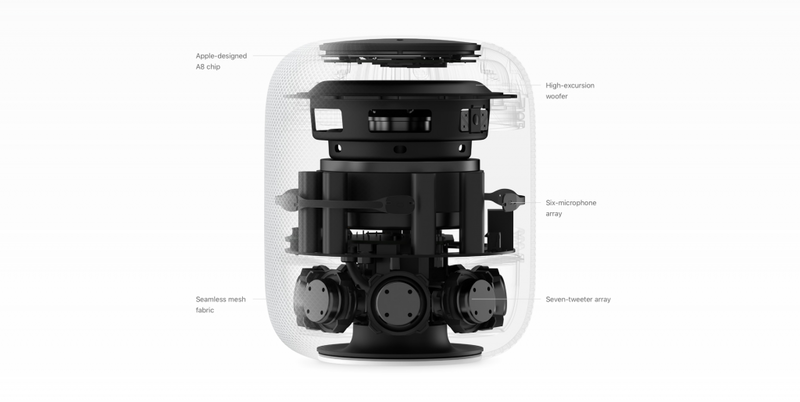 In HomePod it has seven tweeters, High-Excursion Woofer with an amplifier and six microphones. The internal low-frequency microphone can correct and calibrate the bass automatically. The transparent studio level dynamic processing can give you a surround sound in your room. The another technology is the acoustic analysis so that it can offer you the sound in an optimal direction because of it; you can place the speaker in anywhere in your home. Without wireless, the speaker is an ordinary music speaker; wireless connectivity makes it easier to connect between different environments. Apple’s solution for the connectivity in HomePod is WiFi with various bandwidth options. The another technology is that the AirPlay 2, it is the latest version of AirPlay. Using AirPlay 2, you can control all the HomePods in your home. The HomePods are communicating through AirPlay so you can play music on all your HomePods at once. Using AirPlay 2, you can connect all the other AirPlay supported devices to your HomePod. Apple Music is the best service that provided by Apple for all the music lovers in the world. Using Apple music service we can listen to original songs in its best quality. In HomePod we can also use Apple music streaming so we can enjoy the music on our HomePod in High-quality sound. Siri makes fun and sometimes helpful on all our iOS and MacOS devices now it is in the HomePod, so things are getting easier. If you are an Apple user, you will love it. It seems like the latest update for Siri makes it much more natural than before. Now Siri can handle different kinds of activities. The skills of Siri is also better in the latest update. Now Siri can compete with Google assistant and Amazon’s Alexa. In the end, we can say that in performance and sound quality Apple HomePod is better than the others because it uses the mobo processor to boost things up. But that doesn’t make it best. Home management is the primary thing that almost all buyers are considering before purchasing the Home speaker so that we should wait until the release of HomePod. Before the release of that product, we can’t say that it is the best. HomePod will release in December 2017 after that we can make a clear decision about which it is the best home speaker, until then stay tuned with us. We’ll update this review as soon as the release of HomePod. Till then we have some exciting articles for you that writing by understanding the people’s desire. Thank you, Have a Great Day.